This isn’t a particularly insightful post, at least not is you’re really into EVE Online. This is more of a reflection and maybe a bit of info for those who do not play or to somebody years down the road researching the game I suppose. It is one of the quirks of there being one EVE Online server for the whole world that the time of day plays into what opportunities you have. Okay, there is another server. But the population on the Serenity server in China is small enough that it doesn’t really count. The current count on the relaunched server is frankly tiny. And the players in China have ways of slipping through the Great Firewall to play on Tranquility with the rest of the world in any case. Anyway, there is a pretty consistent ebb and flow of population over the course of the average day on Tranquility, or TQ. 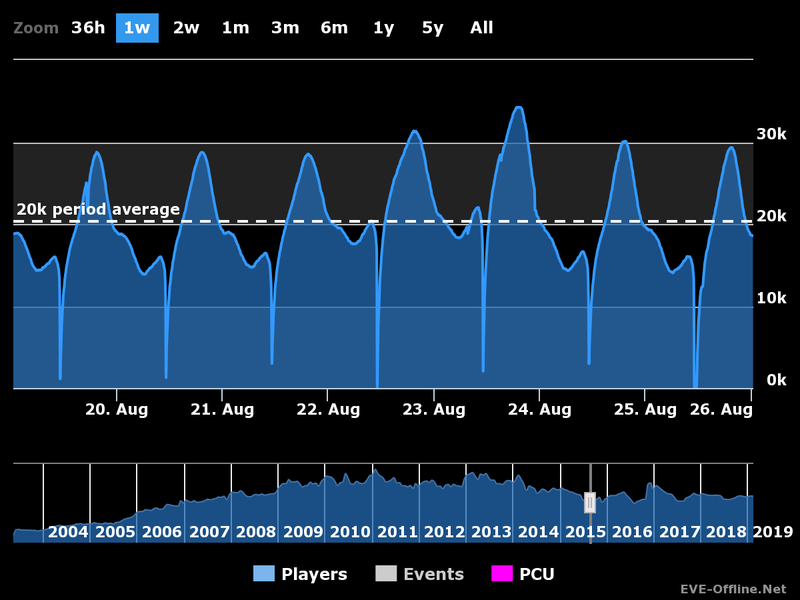 You can see it repeated ad nauseum on the charts over at EVE Offline, the same hills and valleys over and over. The deepest valley in the day is down time, the daily restart of the server that hits at 11:00 UTC and kicks everybody offline for a few minutes most days, though it can be longer from time to time. Since downtime hits at 3:00 am or 4:00 am local time for me, depending on whether or not we have daylight savings time in effect, I’ve never been up and awake and online when downtime has hit. I’ve been logged in. I left my ship drifting during B-R5RB and went to bed, getting logged out at downtime, but I was fast asleep. That, however, is mid-morning for for those in Europe, early afternoon for the Russians, and passing midnight for those in Australia, with the former two already starting to ramp up the online population. There is something of a daily ski jump in the chart every day before downtime. From there things keep ramping up as the Euros get into their evening and day breaks in the US, peaking at around 20:00 UTC. That is still a bit early for me on the west coast of the US, being about lunch time. The Russians, then the Euros, start logging off as the US and Canada hit their prime time. I’m usually not able to get on before 00:00 UTC, by which time all the sensible people in Europe have gone to bed. The steep downward slope flattens just a bit as US prime time hits, but continues on down to the daily nadir around 06:00 UTC, when the population begins to ramp up again for another day. Exciting though all of that is… sarcasm, sorry…the real impact is what it means for those playing the game at any given time. And it just isn’t PvP. Yes, if you want to blow other people’s ships, you’re better off logging in when the population is at its peak. Likewise, if you want to stage a million dollar battle, it should probably be timed to commence in the evening European time to let the US players get in on it… though, honestly, experience says that a bunch of us in the US will call in sick or find a way to be home for these things if they are early in the day. But the population count also has an impact all all sorts of PvE tasks. If I am playing World of Warcraft, the current server population doesn’t have a lot of impact on me. In part that is because I play on a US timezone server, so the population is likely to be peaking when I am on in any case. But even if I have insomnia and log in way off-peak, unless I want to use the dungeon finder or queue up for a battleground. And, even then, the fact that those work cross server means that I am not totally without hope of getting a group of the fellow sleepless together. But running around doing quests in the open world isn’t much changed regardless of when I am on, give or take running into a few people out in the world. In EVE there is the obvious effect that, when more people are online, there are also likely more people likely to be hunting you as you go about your business. There are more gankers waiting for you in Niarja, more followers of James waiting to bump your mining ship, more gangs on gates while you’re trying to haul your PI or minerals back from low sec, and more scouts looking to get you while you’re running anomalies. But it also affects you even when somebody isn’t looking to shoot you. I’ve been out doing a bit of ratting with an alt after taking over a year off. I’m back to running the much beloved Blood Raider’s Forsaken Hubs. I have a post about that brewing, once I hit a particular milestone. I make a point of doing that as far from peak hours as I can possibly manage. That is, in part, for safety. I’m usually tabbed out as my drones take care of the rats for me, so I pretty much never dock up when a hostile shows up in system and my response time when I get jumped can be comically slow. Again, there is a tale behind that. So being on when there are fewer hunters is probably a good thing. But there is also a competitive need for that. In a world where the easy and cheap solution to subcap ratting is a Vexor Navy Issue running forsaken hubs, there are only so many such sites to go around in a given system. When I have tried to do a bit of ratting closer to peak hours it becomes a task finding a system where you can reliably land in a hub and not find somebody’s VNI already feasting on Blood Raiders. You end up either having to watch the probe scanner to try and jump on a fresh pop or you have to find a system where there isn’t so much competition. And, of course, the systems without so much competition tend to be pipe systems with lots of hostiles passing through looking for targets or those near NPC Delve where hunters stage. I’ve actually fewer encounters hanging out in a pipe system, most likely because the hunters probably expect you to be more on your guard, but lots of non-blue traffic coming and going does put you on edge. I recall, back in the day, that when I was running missions in high sec, that the population of the current mission hub I was hanging out in was also had an effect on how things played out. There seemed to be a limit to the number of mission spaces the game would allocate in a given system, so at peak hours you could end up being sent out of system, often more than just a jump or two. I recall one of the reasons for packing up and moving to Amarr space was being in a seemingly safe mission hub system only to have the agent assign me missions half a dozen jumps away in low sec. At the time I was still figuring out how to deal with NPCs, so having players show up to shoot me discouraged taking those missions. Anyway, I’m not sure I’ve arrived at the point I set out to make. That is the problem with just thinking about a topic and setting it to write before you’ve really nailed down where you want to go with it. But I’ve used up my writing time and I’ve got nothing else on tap, so this is what you get. This entry was posted in entertainment, EVE Online, Null Sec and tagged Just Rambling, No Real Point on February 6, 2019 by Wilhelm Arcturus.